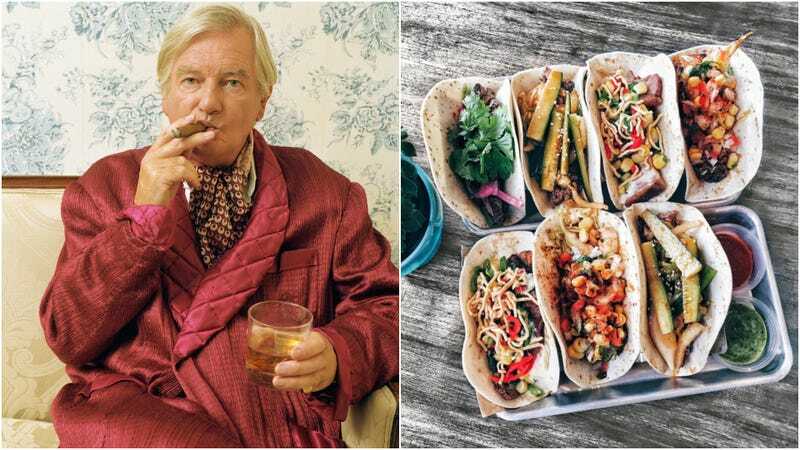 It’s a story that could definitely fall into the category of “stunt food”: The Detroit Free Press reports that Dearborn, Michigan restaurant M Cantina is selling $60 tacos. Not only that, you have to buy three at a time, so it’s an $180 plate of tacos. To lure the prospective presumably wealthy diner, chef-operator Junior Merino packs the pricey plate with the following: “seared American Wagyu beef, a knob of Hudson Valley foie gras, pearls of Golden Osetra caviar and shaved black truffles. It’s topped with leaves of the succulent ice plant and served with a side of Hawaiian salt, smoky chile morita sauce and roasted grasshoppers for crunch.” It’s hard to think of a more exotic mixture that could entice the adventurous foodie. I was thinking I wanted to do something different, something unique, something people can discover the diversity of Mexico and Mexican cuisine at a different level—at a level a lot of people haven’t seen unless they’ve traveled to New York or Mexico City, where you can find some of these restaurants. Merino points out that many Mexican ingredients are expensive and complex—making mole can take at least a day—making the “cheaper the better” taco an unfortunate and incorrect stereotype. And after all, Detroit, like other metro areas, has seen a recent push into exorbitant menu items that hungry folks will actually pay for. There was the $55 Rugby Grille burger, followed by the $80 cocktail at the Bad Luck Bar—which was eventually replaced with a $120 option.